Westfield Football Club’s match away to table-topping opposition today (Saturday) has been postponed. The Westies were due to visit Macron Store Southern Combination League Division Two leaders Roffey, but the game has been postponed due to a waterlogged pitch. Allan McMinigal on the ball for Westfield against Clymping. Westfield have risen to fifth in the table - level on points with fourth-placed Sidlesham - after winning their last five matches, scoring a remarkable 26 goals and conceding only two in the process. They have already been to Roffey once this season, conceding a last gasp goal to lose 4-3 in a Division Two Challenge Cup first round tie after producing a terrific fightback to level at 3-3. Roffey lost 3-0 away to Bosham last weekend in their first outing since way back on December 2, but they remain the division’s leading scorers with 51 goals in 16 games. 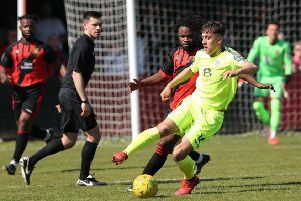 “The way we’re climbing up the league is putting a bit of pressure on people,” added Stapley, who described Roffey as ‘probably the best overall side in the league’. Apart from injured captain Martyn Durrant, Westfield are around full strength at present and they will end the month with a home game against third-placed Alfold next Saturday (January 27).